At the House Judiciary Committee meeting on WikiLeaks and the First Amendment, consumer advocate Ralph Nader asked that four statements by distinguished persons be placed on the official record. Actually, I would recommend these brief statements to anyone concerned with understanding the potential ramifications of the attacks against WikiLeaks. These items, authored by persons from different ends of the political spectrum, show us what's at stake. Their message is that whatever concerns you or I may have about persons associated with WikiLeaks, treating them as potential criminals poses dangers of an altogether greater magnitude than the leaks themselves. A statement by Jack Goldsmith, a conservative Republican who served in the Department of Justice during the Bush Administration. Forbes interview with Julian Assange. Assange announces a forthcoming release by WikiLeaks that will show a corporate cover-up by the banking industry. 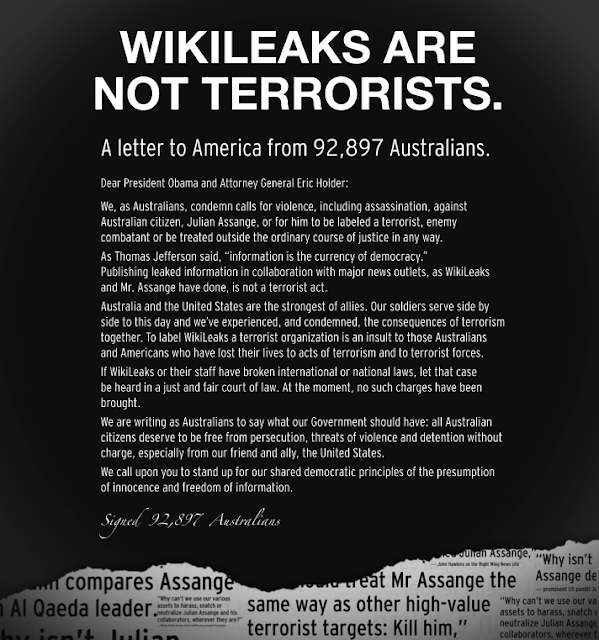 A 'Letter to the America' signed by 93,000 Australians published as a full-page ad in Thursday's New York Times. The ad was sponsored by GetUp.org.au." See above, PdF here. Ron Paul statement on the House floor on "lying us into war." The statement includes 10 questions to consider. I've posted the video below. 5. "Getting to Assange through Manning," by constitutional lawyer Glenn Greenwald. It's a response to the specific legal arguments that the US government is said to be planning to use against WikiLeaks as first reported in the New York Times on the day of the hearing. The US better be very careful. “You know, this whole WikilLeaks incident really makes us think hard about the role of IT security in business and government. In this case, it appears that just one person was able to violate organizational policies and leak such vast amounts of information. By the way, speaking of this, I came across a very thought provoking blog titled Identity, Security and Access Blog. It is apparently written by a Microsoft security expert, and it raises some very thought provoking points which get to the essence of the incident. It is definitely worth a read and I’d highly recommend it. By the way, just in case the link doesn’t work, you can find it over at http://www.identitysecurityandaccessblog.com. Anyway, let’s hope something like this doesn’t happen again.